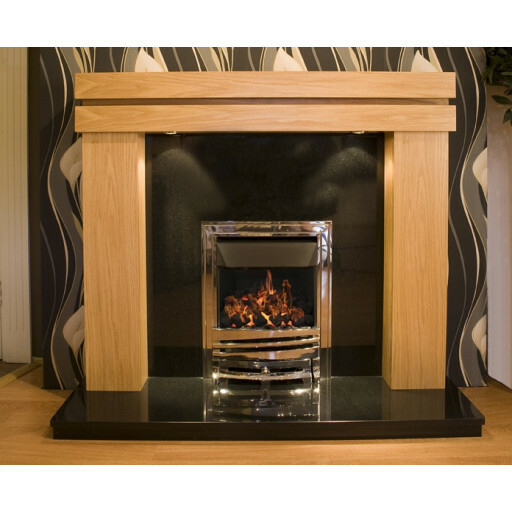 For a sleek modern look that can fit into any home, choose the Ross Oak Veneer fireplace. This modern take on a classic design will instantly elevate any homes decor. As with all our models, the Ross is made with the best materials including an Oak veneer with an inlay of American Walnut. Complementing the wooden fireplace is the twin halogen downlights to create a modern and sleek feel. The Ross fire surround is an extremely flexible product that can be customised to perfectly compliment the interior design of any home, with the choice of either black granite or light cream marble hearth and back panel. The Ross is made to last both through its quality construction, and lacquer treatment. We make sure each of our fireplaces is properly treated so you won’t have to worry about maintenance and refinishing. With the Ross, you will receive a quality oak fireplace at an affordable price.